GREAT DRONE VIDEOS.ca specializes in low altitude, high definition aerial imaging services, including aerial videography and aerial photography. We offer a cost effective alternative to manned aircraft for a variety of applications in the fields of Brand Marketing, Engineering, Construction, Aggregates and Mining, Environmental Planning & Monitoring, Agriculture, Forestry, Archeology and something we call 'Memories' (see below for definitions). We also provide expert video, special FX, motion graphics and photo retouching services. Note: Our Pilot is UAV Certified by a Transport Canada recognized training facility and we are fully insured. Both of which are requirements by Transport Canada for safe Commercial Operations. The sky is no longer the limit! GREAT DRONE VIDEOS™ soars beyond our horizontal lives - from the International award-winning company inspirtainment inc™. Creating stunning aerial imagery takes much more than the latest drone technology. It takes vision, passion, experience and an eye for the extraordinary! With over 50+ years combined experience in visual arts, from advertising, broadcast TV and photography to motion graphics and animation, when WE see the sky, we see a canvas for unlimited possibilities! Serving Southern & Central Ontario and the beautiful Surrounding Skies! For unique advertising, photographic and video campaigns! Call GREAT DRONE VIDEOS (905) 342.1038 or email us today! We really do love what we're doing! See for yourself! Think beyond your horizons. Think GREAT! We are all only limited by our imaginations. Fly! inspirtainment inc™ was created to inspire and entertain. We are award-winning visual communicators working with companies, individuals and entrepreneurs of all sizes. We create original logos, branding, video and broadcasting for your products and services. Everything digital to ink! AND WE FLY! (n.) the harmonious synthesis of inspiration from unrelated and unexpected influences and the work that takes up one's attention: habitual employment, craft or trade. It's a word we created years ago. We love what we do. We really do and are constantly on the lookout for opportunities to expand our creative horizons. We help you transform your business and your dreams with a whole new perspective. Drones create a new visual paradigm made possible by flying high quality cameras to almost any desired vantage point. Below is a small sampling of the various aerial possibilities we offer. Harness your memories TODAY! This is special category that's often overlooked - or not even considered - but yet very dear to everyone's hearts. As much as we don't like to admit it we all get older. Retirement homes have to be looked into, lifelong homes and beloved cottages have to be sold and forgotten, and family members and friends pass on. Our cherished memories fade. Call us to fly around (and in) that cottage wonderland you grew up with NOW. Picture your parents - years from now - waving at the camera from their favourite beachside chairs. Call us to help you harness your treasured and lasting memories TODAY! We can help you analyze your crops to see where problems might develop. From multi-million dollar projects to single family homes, our aerial flexibility is without a doubt the best tool for real estate agents and developers. From taking stunning general views of your properties to zooming in on important selling features, let GREAT DRONE VIDEOS transform your marketing possibilities. How about showing your potential clients the exact view they will have while driving up their driveway or from their balcony before the condo complex is built? Drones are able to carry very high resolution cameras that deliver cinematic quality 4K files. Cameras and the drones are getting smaller making this available to more and more creative filmmakers and broadcast experts like us. If you look carefully at movies and documentaries today, it is hard to find one that has NOT made use of drones to create very dramatic effects. Get a bird's eye overview of the progress of your various construction sites and build an archive of your progress and achievements for your marketing. Think seasonal time-lapse footage too. Have you undergone a wide scale destructive event like a fire, earthquake, violent storm over your land, locality or company premises. We can use our drone expertise to quickly assess the damage to give your insurance company the total picture. Create unforgettable outdoor souvenirs of important corporate, entertainment or life events like outdoor concerts, inaugurations etc. Our drone can easily fly indoors with proficiency and surveillance with its multiple navigation systems and object detection. Get dramatic vantage points of your advertising or architectural designs. Industrial sites that cover wide areas can easily be surveyed, photographed or filmed with drones. Volumetric assessments are also possible in mining and quarry sites. From the air we can survey large areas for planning pre-construction of multi-housing projects or highlight the surveyor's borders from the sky. In edit we can also overlay a 2D blueprint or 3D view of forthcoming constructions. A great tool for urban development, archaeological research, golf course design or maintenance, ski slopes management, stock or volumetric inventory and so much more. We can help you inspect hard to access places like the towers, rooftops edges, bridges, windmills, electrical installations etc. GDV-i (GREAT DRONE VIDEOS/inspirtainment) provides documents prior to �Day-of� which outlines all pertinent UAV mission information, which is attached to call sheets that everyone involved receives prior to the UAV mission. �Day-of� operation there is a safety meeting given to all personnel involved with the production. During the days operations GDV-i might give additional safety instructions / meeting depending on location, UAV operation at the location and/or environmental changes. The area will be closed (further referred to “Lock-off “) to all general public within 150 feet of the UAV operations at all times. The 100 feet guideline provided by Transport Canada is not sufficient for most projects due to the nature of various locations so a minimum of 150 feet is used instead. Ensure there is NO reasonable possibility of spectator incursion as we are operating. We (Pilot and Observer) personally conduct an in-depth, Pre-Flight, On-site Survey well before our SFOC application and another personal survey on the 'Day of' our mission (Pre-Flight). We adhere to all accepted safe flight practices such as NO flying over people (other than crew and people engaged, well informed and consent gained about the flight) and a minimum of 150 feet away from the general public, structures, vehicles, vessels. The aircraft and Remote Controller are either locked in our company vehicle or personally under direct control of the UAV Pilot only, to ensure no unlawful interference. The Remote Controller/Display Device is time-locked and password protected. Note: flight within 150 feet horizontally of persons not involved in the operation of the UAV is not permitted. Flight within 100 feet horizontally of buildings and occupied vehicles or vessels will not be permitted without the owner’s consent and lack of objection from the occupants. There is nothing in this mission within 100 feet of roads or rights of way or within 100 feet of occupied vehicles (without the occupants’ permission). We use a well marked Take-off/Launch, Landing/Recovery Pad (reflective bright tape), and we remove all non-crew (general public) from operating area. Safety Cones: Large bright orange (as used on traffic & construction sites) to designate Take-off/Launch & Landing/Recovery pad 'Staging Area'. A minimum of 150 feet is maintained for people not involved in the UAV operation/mission. During lock-off which takes place during the UAV operation (prior to take-off, airborne & landing) will be closed all general public access per the above enforcement. Any buildings or structures within the lock-off area will be notified and the site manager and/or security will assist on the lock-off of residents or employees. Permission is been obtained before flight for the property over which flight of the UAV will take placefrom the landowner/curator in person during a visit to the site. A detailed site survey is conducted immediately after permission was given and will be repeated on the 'Day of' mission. GDV-i ensures all authorities are contacted and permission is obtained for every operation. With the above info, all permission and permits are required / provided before entering the location for UAV operations where applicable: City (Film) permits, Ports Authority, Parks and Recreation, NavCanada, Transport Canada, NOTAM and Private and/or Commercial Property owners. NO ACCESS - depending on location and speed we generally increase the lock-off area. Non-Essential “Production Personnel”: people involved in the overall production but not needed for the UAV operation. key subjects/crew = given additional safety meeting to be aware of UAV will be operating near or over them. GDV-i prepares operation-specific PDF's for GPS Latitude/Longitude boundaries and Flight Areas. Area - The operation is assessed for all hazards by the Pilot and Observer. General Public - The areas will be closed to the public during operations / vicinity of the flight path (100+fteet from UAV). Rouge/Failsafe - Will set control boundaries to maximum 100 feet vertical for rouge prevention / failsafe & manual override will be tested prior to shooting. The objective of this plan is to maintain the highest level of public safety by developing prevention and preparedness solutions to possible emergencies. Note: Our secondary and passive role continues to refine processes and documentation. When a “Special Flight Operations Certificate” has been issued by Transport Canada, GDV-i will meet all the conditions of the certificate. The restricted area is off limits to all public vehicles and general public during the UAV operations. DGV/i understands and acknowledges that relying on calling 911 would not, meet the standard expected of an emergency contingency plan and; that calling 911 is only related to the emergency contingency plan actions and that it is not appropriate to call 911 for aircraft-related emergencies (e.g. lost link, fly-away, damage to UAV, etc.) Joint Rescue Coordination Centers are not contacted for any UAV related emergency or accidents. All participants of the lock-off operation, and GDV-i staff will receive a safety briefing describing the UAV operation. Ensure that all persons associated with the operation who may be required to respond to an emergency situation are briefed in advance of the operation (e.g. available emergency services, methods of contacting emergency services, checklists. The details of any major emergency that occurs are to be reported to the Ground Supervisor who makes the decision whether an incident is serious enough to suspend or end the UAV operation. Will prepare and conduct a though investigating: informing the City, Work Safe, Transport Canada and Production the day of incident. Will have radio contact with all emergency services agencies and relay required information to responding agencies. Responsible for traffic control, parking control, site security and general operations, and is to coordinate with the Pilot in the event of an emergency. Has authority to notify and stop UAV operations if they feel the secured area has been breeched. Notifies the Pilot to suspend operations, (initiate RTH, Return-To-Home) and will organize re-closing off the area to public. Mobile phones are to be used to establish communications between key GDV-i personnel. The Ground Supervisor/Observer conducts a test prior to operations and a list of key personnel and their contact cell phone numbers forms part of the daily briefings. In the event of a major emergency where emergency services become overwhelmed, the Ground Supervisor/Observer will notify City and County’s Municipal Emergency Plans. The local hospital will be informed by the Ground Supervisor/Observer as needed. The aid station will be established at staging area vehicle. Includes such things as First Aid Kit and fire extinguisher. The Ground Supervisor will coordinate all security measures. See the preceding "SECURITY PLAN"
Briefings and Meetings: All personnel are briefed on this emergency plan prior to the UAV operation. A special briefing of all emergency personnel will occur 'Day-of' - special hazards, UAV familiarization and emergency considerations. If within uncontrolled airspace, abide by automatic Fail-Safe Return-To-Home (RTH) procedure. Follow the 'Emergency Procedures' and 'Security Plan' detailed in this 'docs' section. The Pilot in Command is at all times the final authority over his UAV and should be in command of his flight operations and/or related activities. The Pilot in Command and/or Aerial Coordinator should have the authority to abort any flight operation in the interest of safety. Abort signals are specified ahead of time. Communications: The Aerial Coordinator and/or the Pilot in Command will coordinate with the designated team and implement a plan for communications between the participants in the air and on the ground. At the start of each day’s video shooting the Aerial Coordinator and/or Pilot in Command and the designated production representative will conduct a BRIEFING/SAFETY MEETING for the production staff and those persons necessary for filming, including emergency, safety and security personnel. No changes. A preplanned video shooting sequence will not be changed in any way without the authorization of the Aerial Coordinator and/or Pilot in Command. No changes should be made once the UAV(s) is/are airborne. One person. The Aerial Coordinator and/or Pilot in Command should designate one person as the Ground safety contact with no other responsibilities. The Spotter may be designated as the ground safety contact around the UAV, if qualified. If there is a question as to safety of any aerial filming sequence involving low, over the camera shots, a Briefing/Safety Meeting should be held between the Aerial Coordinator and/or Pilot in Command and concerned persons as to whether the use of a locked-off camera is necessary. An exclusion zone will be established with physical barriers to provide a secondary safe landing zone, and will be staffed by at least one competent person, equipped with communications linked to either the PIC or Spotter. Remain at least 100 feet away from the UAV unless directed by the Aerial Coordinator and/or Pilot in Command or ground safety contact. Under no circumstances should you approach the UAV without permission from the ground safety contact or the Pilot in Command. Always have eyes on the UAV when within 100ft of operations. Never walk through or under the Flight Path of the UAV, whether it is running or not. Carry all equipment parallel to the ground when within 100 feet of a UAV. Do not vertically extend any equipment, (i.e. cameras, lights, or sound boom) into rotor blades, whether it is running or not. Necessary Crew and Persons Authorized for Flight operations closer than 100 feet of persons will include only those persons consenting to be in close proximity to the aircraft and who are directly involved and necessary for filming. The Aerial Coordinator and/or Pilot in Command and the designated production and security personnel will maintain an area perimeter to insure that no unauthorized persons are allowed within 100 feet of the flight operations. Personal Protective Equipment should be utilized as required. Never throw under any circumstance anything such as grip tape, clothing, paper, etc. around the UAV, whether it is running or not. The Take-off/Landing 'Staging' area should be cleared of debris and, where necessary, wet down. Ensure all equipment is tied down or stored away from the area. 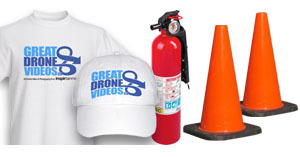 Do not wear any loose clothing that may blow off, such as hats, when operating near a running UAV. Protect your eyes, as well as your equipment, when UAV is landing or taking off. Rotor blades and fuselage can be easily damaged while on the ground. Never push, handle, or lay any objects of any kind on an aircraft without the pilot's permission. If a foreign object falls into or against an aircraft, report it immediately to the pilot or aerial coordinator. No distractions. Never allow participants, cast or crew to approach or distract the flight crew while engines are running or rotors are turning, unless authorized by the Pilot in Command, or there is an immediate unseen danger. When working on location or when utilizing Department of Defense aircraft, local agencies, regional police, fire, park department regulations, or military guidelines may vary from this bulletin. The more stringent guidelines will always be in effect. Additional permits may be required for landing or flight operations. The co-production participants must notify all participants, cast and crew members and the front of the studio call sheet should contain a statement to the effect that: "A UAV / DRONE is being used and will be flown in close proximity to crew and equipment. Anyone objecting will notify the Operations Manager prior to any filming. UAV flying accuracy may be adversely affected by changing natural conditions such as wind, air density, humidity, and time of day. Manmade conditions such as weight, weight distribution, center of gravity and/or the discharge of pyrotechnics in close proximity disturbing airflow around the rotors, can also affect the ability of the UAV to fly. Special precautions should be taken to ensure safety when working in any extreme temperatures or terrain, e.g., trees, mountains and deserts. Today is an opportunity to FLY RIGHT tomorrow… work safe. Copyright © 2016 inspirtainment.com. All rights reserved.